Large "Telephone Table" in shagreen embossed leather with inset glass top by Karl Springer, American, 1980s. Large "Telephone Table" (side or end table) covered in graphic embossed leather by Karl Springer, American, 1980s (label on bottom reads “Karl Springer”). Dramatic side table with glass top in the 1980s taste with large diameter brass supports. The table goes great with its glass top or buyer-supplied marble top. 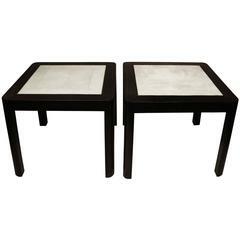 Pair of Faux Snakeskin tables in the manner of Karl Springer, American, circa 1970s. They are a versatile size and can be used as end or side tables or as nightstands.